Palms thrive well under different soil conditions varying from littoral sands to red loams and laterites. Palms grow well up to an altitude of 3,000 ft. above the sea level. It is fairly resistant to diseases and pests. The nut is medium to big in size varying in shape from spheroid to linear-oblong and with colors varying from green, yellow and orange to shades of brown. About 6,000 nuts yield a ton of copra. 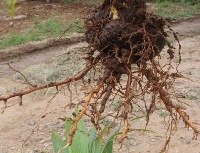 Dwarf coconut palms flower as early as the third year after planting and come to regular bearing in the ninth year. The average life span is 40-50 years. Dwarf or short variety which producing green, orange and yellow nuts. Nut weighs about 3 oz (85 gm) with 65 per cent oil content. 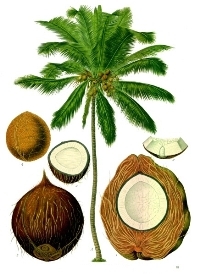 Hybrids are the intervarietal crosses of two morphological forms of coconut. They show earliness in flowering and give increased yield, higher quantity and better quality of copra and oil when compared to the parents. When the tall is used as female they are called T*D hybrid while the reciprocal is known as D*T hybrid. Hybrids perform well under good management conditions including nutrient management and irrigation. 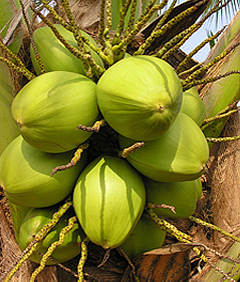 Hybrids are the intervarietal crosses between the two morphological forms of coconut. They exhibit earliness in flowering, increased nut yield, higher copra production and give better quality copra and oil as compared to the parents. Hybrids are produced in two ways, with tall as female parent and dwarf as male parent (Tall x Dwarf) or dwarf as female parent and tall as male parent (Dwarf x Tall). Besides intervarietal hybrids like Tall x Tall and Dwarf x Dwarf are also produced. One of the most useful plants is the coconut palm, Cocos nucifera, which is grown around the world in lowland tropical and subtropical habitats. From this species we can get many natural products, including foods, drinks, fibers, building materials, and chemicals.. The plant is a feather palm, which means that its leaves are pinnately compound (like a feather); these leaves are frequently used in thatching. The long trunk of the tree is used for building supports. Coconut palms are an excellent source of food for native peoples in the tropics. Fruits are rich in calories and essential vitamins. This fiber is called the coir and is used for making mats and rope. The shell is used for containers and is widely employed by artisans to make ornaments and decorations. The solid endosperm, copra, is harvested, dried, and then pressed to release the oil, widely used for chief ingredients of shampoo and hair conditioners. Within the endocarp, soft white endosperm enclosing inside a big cavity filled with extra-cellular fluid called as "coconut milk." The seed coat, which is thin, and then the white flesh or copra .Both the copra and the milk are the endosperm of this seed. Initially the milk is fairly sweet and the copra is thin, but as the seed matures, the liquid is converted into solid endosperm rich in oils (triglycerides). Liquid endosperm contains large quantities of cytokine hormone which is useful to grow plants in test tubes from single cells and this develops into embryos. Mother Palm Selection & Nursery Mgt.